See Google Earth at Grid Reference: S25 58' 16" E28 21' 02" or Google Maps. 1. Follow the R21 highway from Jhb. Int. Airport towards Tshwane (Pretoria). 2. Approx. 10km from the airport, take theR25 off-ramp (BRONKHORSTSPRUIT/THEMBISA) and pass under the highway towards Bronkhorstspruit and Bapsfontein. 1. Take the Rigel Turn-off from the N1 South and turn left into Rigel. 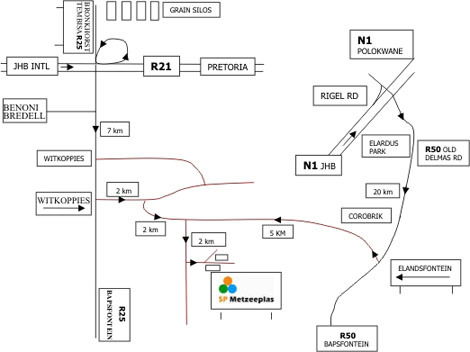 Rigel becomes the R50 (Old Delmas Road) and runs through Elardus Park. 2. Approx. 20 km after Elardus Park, just after Corobrick and Bila-Bila, look out for the ELANDSFONTEIN sign (on the left) and the Friendly Robotics / Store-It signs (on the right) of the Old Delmas Road (R50). Turn right onto the dirt road.